Dental care shouldn’t break the bank, so we’re insurance friendly and offer flexible payment options. Clear and accelerated orthodontic options let you straighten your teeth on your terms. Replace missing teeth and restore your smile with start-to-finish dental implants. We can care for most of your family’s dental needs under one roof to give everyone a healthy smile. Check out our Dental Savers Plan! Welcome to Arlington Dental Center in Arlington, VA! We believe in the three Cs when it comes to care: comprehensive, convenient, and comfortable. What does that mean for you? That means we can meet all your dental needs with our full line-up of treatments. We offer easy scheduling for the whole family with block appointments, plus flexible financing options that are easy on your budget. And we do all of that in a warm, welcoming office with modern technology, including 3D Printing and Scanning, and patient amenities. Schedule an appointment today to experience our difference. Use our online registration system from the comfort of your own home to submit patient information prior to your appointment. We take great pride in staying on the leading edge of dentistry. What exactly does that mean? It means that our practice goes the extra mile to stay on top of the latest dental innovations and techniques, as well as attend continuing education courses and training seminars to ensure that we are providing patients with the highest quality care. 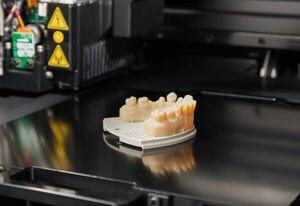 3D Printers & Mills: We have multiple in-house 3D printers and mills that allow us to create a variety of restorations including crowns, dental fillings, bridges, veneers, and more. Each restoration is made with more precision and has a better fit compared to practices that use off-site dental labs. CEREC® System: In the past, restorations could take up to three weeks to complete from design to creation. Now, with our state-of-the-art CEREC technology, we can design, fabricate, and place beautiful restorations in a single office visit. 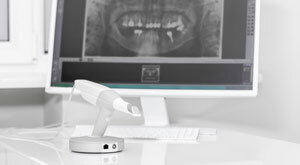 iTero® Oral Scanner: Our revolutionary iTero scanner can quickly capture thousands of images of the inside of a patient’s mouth, and turn those images into detailed 3D models within minutes.